Tonight’s my night of Barley Wines, after seeing Anchor Steam’s Old Foghorn Barley Wine available in Manitoba for the first time (at the low low price of $3.95/355mL bottle), I knew it was time for a Barley Wine party of one! 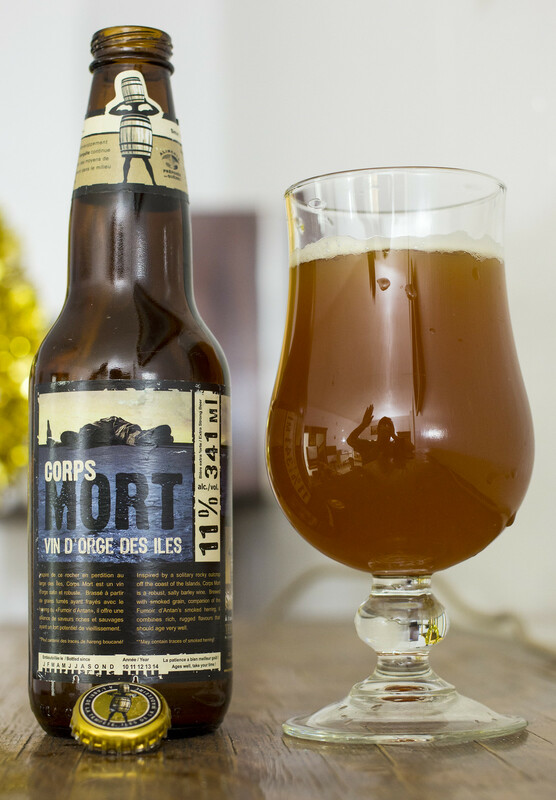 Back in 2012 I received a bottle of Corps Mort by À l’abri de la Tempête brewery from Îles de la Madeleine. The bottle intimidated me immediately, with a name like “Dead Body” and a graphic of a “dead body” scared me off. But that’s what makes a beer truly authentic. The actual scariest part for me is that the beer warns that there may be traces of Herring. Traces of Herring? In a Beer?! What the heck?! Apparently, with the brewery being on a small yet cozy island, they have their malt smoked in the same place as where the local fishermen smoke their Herring, so that kind of makes sense - Community pride! À l’Abri de la Tempête is one of my favourite breweries. It’s hard to find, but when I visit Quebec, I buy a few bottles of anything I find. 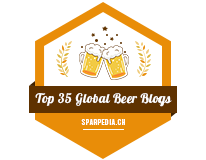 Their saison is possibly one of the best saisons in Quebec, if not - in Canada. So here I am.. with a bottle of Corps Mort Barley Wine warming up and I’m just writing about it.. eventually I’m going to have to review this as I’m not one for being known to throw out perfectly good beer. Appearance: The Corps Mort is incredibly heavy, a dark orange with lots of sediment and cloudiness to it. Seeing that this beer’s been aging for over two years, I’m not surprised in the slightest. As it’s poured, a nice amount of cloudy beige foam forms on top, but quickly makes its way to the sides of the beer glassware. Nice amount of carbonation, and a bit of a grapefruit hue to it. Aroma: For it being a Barley Wine (vin d’orge), it has a very present smoked aroma to it - which I have never seen so far in a barley wine, a bit of a smoked woodiness to it. Notes of caramel, various cereals, nowhere near as sweet and syrupy as your standard Barley Wine - but there is a touch of caramel in there. Taste: Thankfully I don’t taste Herring in this beer, phew! It’s a combination of a smoked beer meets a Barley Wine. I immediately get presence of charred wood, lots of smoke, but then there’s sweet caramel notes, flavours of dark fruits like raisins and finally a presence of a light syrupy taste to it. Out of all the Barley Wines I’ve ever had, this one is the most unique - yet. It also has flavours reminiscent of plain potato chips, hint of dill and another hint of caramel. Overall Thoughts: Thankfully there’s no dead bodies in this beer, nor actual herring in this beer, but seeing that the barley is smoked and malted on l’îles de la Madeleine, this is quite a real treat for a beer geek like myself. It has a great combination of a typical barley wine, sweet, syrupy and dark fruits meets a rural Quebec fish/malt smoking hut. The smokiness reminds me of the first smoked beer I ever had - Lava Stout from Iceland. Visiting les Îles de la Madeleine is on my bucket list. I will do it, en fait, one friend told me about a job opportunity at this brewery several years back during my depressing & crankier unemployment phase, but unfortunately the job was already filled.. 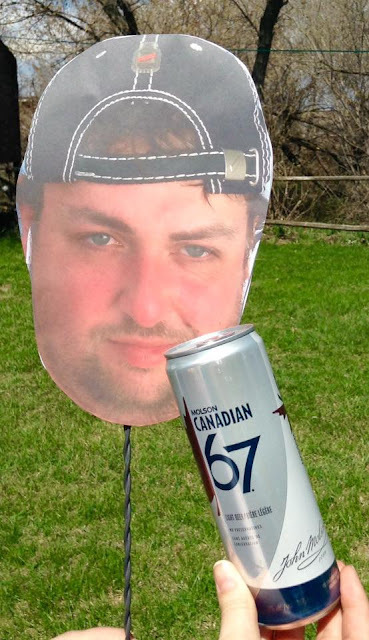 But Santé and Cheers to unique Canadian beers. 11.0% ABV, bottled July 2011 - Oh how life has changed since then!